This year, The Jewish New Year of 5775 comes only two days after the first day of autumn, on Sept. 23rd. Since Jewish holidays almost always have a culinary aspect, I thought I would feature some foods that are in sync with the holiday. And since the foods featured are in season, I thought I would give you a list of what IS in season now. This list is from Serving Up the Harvest: Celebrating the Goodness of Fresh Vegetables by Andrea Chesman, Storey Publications, 2007, which I hope to review soon. The list for Mid-to-Late Summer is: artichokes, celery & celery root, chiles & peppers, corn, eggplant*, fennel, okra, shell beans, sweet potatoes, & tomatoes. The list for Fall into Winter is: Belgian endives, Brussels sprouts, cabbage, carrots, cauliflower*, garlic, Jerusalem artichokes, kale, leeks, onions, parsnips, potatoes, rutabagas, winter squashes & pumpkins. Here is the *Clean 15, that is, those lowest in pesticides: avocados, sweet corn, pineapples, cabbage, frozen sweet peas, onions, asparagus, mangoes, papayas, kiwi, eggplant, grapefruit, domestic cantaloupe, cauliflower & sweet potatoes. *Apples & honey are traditionally eaten during Rosh Hoshanah to usher in a sweet New Year, and since apples are in season now, this food is a perfect one for the holiday. In fact, I purposely don’t eat apples in the summer so I can savor the first crisp apples of fall. The easiest way to serve this holiday food is merely to cut up fresh, organic apples of different kinds and place a small bowl of honey beside the apples for dipping. Last year I posted a recipes for apple cake made with honey, so here is the link for that recipe: https://www.menupause.info/archives/12215. This year I purchased some raw honey and hope to make a honey cake with it, so if I find a good recipe I will post the link or if I come up with my own, I will post that as well. The other aspect of food for Jewish Holidays is to make dishes that have items cut in circles, which represent coins or financial success. So there is carrot tsimmes, a dish made with carrots & honey, round challah (braided bread) with raisins, so it is round and sweet or any round food. 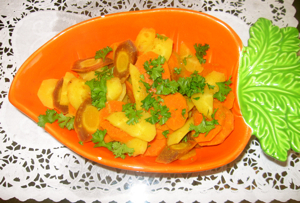 Here is my recipe for carrots with honey. 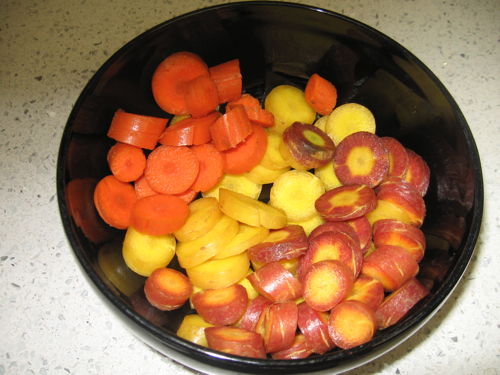 If you can’t get them multi-colored carrots in Whole Foods or Trader Joe’s, use regular carrots. This can be added to other main dishes at the table to “round out” your meal. 1. Place liquid in a shallow saucepan and place on low heat. 3. 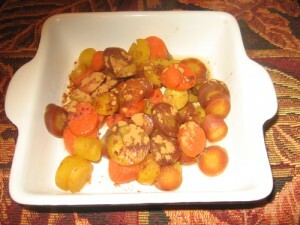 Add carrots to liquid and raise to medium-high heat. Add honey add butter and simmer about 10 minutes. 4. When carrots are tender but not mushy, remove from pan with a slotted spoon and into a serving bowl, sprinkle with cinnamon and serve hot or cold. Variations: Add a peeled and cubed sweet potato. Add prunes. See another flavor variation below. For this dish, instead of using honey, I used curry spices because I am involved in Ayurveda, an Indian health philosophy. So this variation is more spicy than sweet, but the carrots are still coin shaped, so maybe this is Jewish fusion cooking! 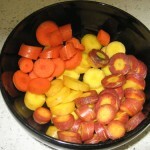 Cook the carrots in a small amount of water or stock, drain and add turmeric, ginger, mustard and garlic in small amounts after tossing the carrots in one Tbl. olive oil. Garnish with parsley. Final variation: Curried Carrots with green beans. 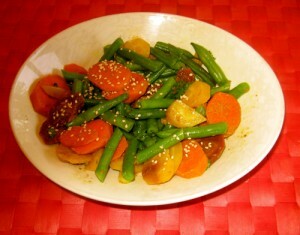 Same recipe as Curried Carrots, but I steamed some green beans in another pot while the carrots cooked. Note: My next Kitchen Nutrition Recipes will be another round food, delicata squash with quinoa, which is also a round seed/grain. I also plan a salad-in-the -round using leeks & radishes. This entry was posted on Monday, September 22nd, 2014 at 10:00 am	and is filed under Kitchen Nutrition. You can follow any responses to this entry through the RSS 2.0 feed. You can skip to the end and leave a response. Pinging is currently not allowed. now I understand the close association of food and the Jewish Holidays. I love this post! My husband and I were just talking and trying to figure out ways to commemorate Rosh Hashanah–I think we’ll give some of these a try! Thanks for stopping by my blog!